Use shadow magic to sneak past or battle your foes. 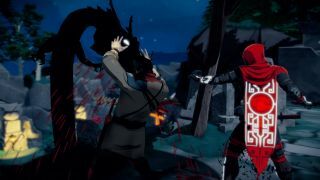 Aragami, previously known as Twin Souls: Path of the Shadows, is a third-person, supernatural stealth-'em-up starring an undead assassin who's quite fond of the colour red. I've been loosely following its development for a while now, and I've just learned today that it's out...today. You might say that it snuck up on me, but of course I would never say such a cliched thing about a stealth-focused game. Let's just say instead that the game has crawled out of the shadows and ow-ow, alright, I won't say that either. You can find the system requirements and more on the various store pages, along with this handy summary of the story. "You are Aragami, a vengeful spirit with the power to control the shadows. You’ve been summoned by Yamiko, a girl imprisoned in the city fortress of Kyuryu." Those shadow powers include teleportation, invisibility, and the power to summon a shadow dragon (along with the ability to wear bright red and not be spotted instantly by the city's guards). Aragami will set you back £15, normally, but there's a 10% launch discount for the next seven days.